Michael 'Chikuzen' Gould (shakuhachi) began learning the shakuhachi, the Zen bamboo flutes of Japan in 1982 in Kyoto, Japan under the guidance of world reknown masters Taniguchi Yoshinobu and Yokoyama Katsuya through 1996 and is one of only a dozen non-native Japanese to ever obtain the rank of Grand Master (Dai Shihan). Since returning to the U.S.A., he has been busy teaching, performing and recording the mysterious sounds of this flute that was the "tool" of Zen monks in Japan during the middle ages. He spent his first two years teaching Zen Buddhism and Shakuhachi at Wittenburg University in Springfield, Ohio, and also was Shakuhachi instructor at Oberlin University, Oberlin, Ohio and at the University of Michigan. Not only giving solo concerts, Michael often performs with the koto (Japanese Zither) and does lecture/presentations on the Zen origins of this "instrument" to help people understand the background culture that gave birth to such a natural "tool". 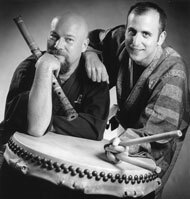 Michael has written and published textbooks for shakuhachi training along with several compact discs and videos. Michael Gould (percussion) is an Associate Professor of Music at the University of Michigan and has received international recognition as a performer and scholar in the field of contemporary percussion performance and pedagogy. Having served for several years as percussion specialist at Huis Ten Bosch European resort in Nagasaki, Japan, Michael has performed with leading artists and performing groups from around the world. He has also taught at Semaine Musicale in Amiens, France, Pitea Conservatory, Sweden, the Tampico International Percussion Festival in Mexico and served on the faculty of Bands of America-World Percussion Symposium. Michael has toured nationally as percussionist/drumset specialist with the performing group the Dallas Brass and can also be heard on the Seabreeze label with jazz artist Miles Osland. He is the founder of the quartet CASHEW. He has recorded two of his own CD's, Michael Gould2 and CASHEW. Michael is a performing artist for Zildjian cymbals, Yamaha Drums and Percussion and Innovative Percussion. He is also currently the chair of the College Pedagogy Committee for the Percussive Arts Society.